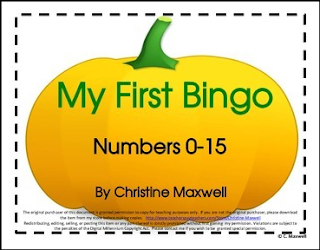 This colorful, fun math activity will help to introduce students to the concept of playing Bingo, or provide practice for proficient players. Great to play during fall, Halloween and Thanksgiving. In color and gray shades! This game includes 3 pumpkin board templates, a nine grid, a twelve grid and a sixteen grid. Also included are little pumpkin calling cards 0-15, plus directions and suggestions for playing. I've added little leaves, jacks and turkey pumpkins cards as an extra surprise to create some excitement. I used candy corn as my counters to mark the numbers and when a picture card is show each student gets a piece of candy to eat! You will need to write the numbers on the pumpkin boards. I had a parent volunteer (Gotta love them!) do that, and laminated them. Another way to use this activity is to give each student a pumpkin and have them write the numbers in the various squares. For example, you assign the numbers 0-10 on the 9 space grid pumpkin. They use a pencil to write the numbers first, to make sure they have written them correctly, and then trace over them with crayon or marker. Then play the game. Students can trade cards for each different game. This product can also be printed in grayscale to save colored ink. The children look forward to practicing their numbers and I get a good visual evaluation of their progress. Please click the "Follow" button. I'm always adding products to my store and would love for you to come back to check them out.